The clever girls and boys at NASA are always dreaming up new ways to circumvent the biggest obstacle to effective space travel: the speed barrier. Space is big, as you might have heard—and it takes a long time to get around. It’s about three days to the Moon, which isn’t too bad; but Mars is another story altogether. With current methods of chemical rocket propulsion—the same that have been used for some three-quarters of a century—a voyage to the Red Planet would take about five months. But a team of NASA scientists, headed by Philip Lubin of the University of California, Santa Barbara, have envisioned a different means of getting about space—one that requires nothing more than a beam of light. 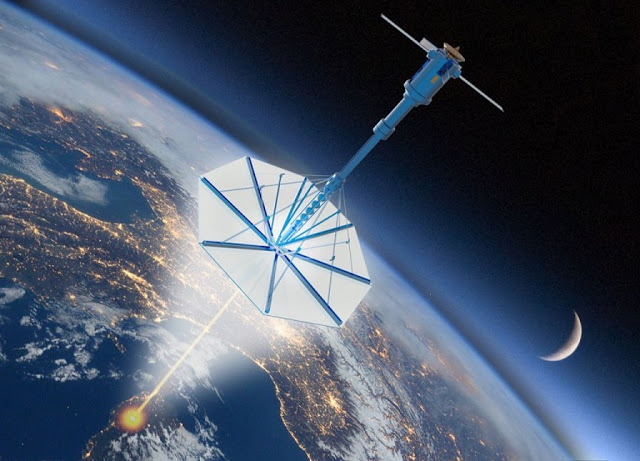 Called “photonic propulsion,” it requires little more than a solar sail of ultralight material, which is pushed along by energy beamed from an orbital laser array.Lubin’s team was awarded a NASA Innovative Advanced Concepts (NIAC) grant, to the tune of $100,000, to begin the planning and testing phase of the project. It is being called—with a typically NASA-esque acronymic flair (though in this case to a somewhat unfortunate effect)—Directed Energy Propulsion for Interstellar Exploration (DEEP-IN). New Paths to the StarsAs we begin to seriously prepare for our first journey to Mars, there’s been a flurry of research into novel propulsion methods to help get us there. One very promising avenue leads to the VASIMR nuclear electric thruster, which opens up the possibility of a journey to the Red Planet in only 40 days. The technology is still in development, and has some key challenges—most notably building a space-capable nuclear reactor to power the engine array—but it seems to be one of the most immediately realizable technologies for fast interplanetary travel.